Pachamama Alliance Website: “The Achuar are a group of indigenous peoples of the Amazon Basin, currently numbering around 6,000. Their ancestral lands – nearly 2 million acres in all – straddle the modern borders of Ecuador and Peru, a remote area that has allowed them to preserve their way of life with little outside influence or colonization.” Yet this is hardly true. The information that follows on the Pachamama Alliance site states as much: “Throughout their history, the Achuar have been self-sufficient and autonomous, sustaining their family groups through hunting and gardening. Once semi-nomadic people, most Achuar now live in small villages, a result of contact with Christian missionaries in the 1960s. While their remote territory largely protected them from colonization, the Achuar did experience some change to their ancestral way of life and observed the destruction of neighboring indigenous cultures and communities.” It is incredible and simultaneously incredibly patronizing that while Pachamama Alliance acknowledges the Achuar have been self-sufficient and autonomous – at the same time they influence and encourage the Achuar to become part of, thus dependent upon, thus trapped in, an economic system incapable of reform. Pachamama continues that “[W]hile the Achuar expressed that their work with Pachamama in Ecuador was important, they also insisted that it was equally important for their Northern partners to ‘change the dream of the North’ – to work within their own ‘modern’ culture, shifting it from wasteful consumerism to a less destructive, more sustainable paradigm.” While this may sound lovely, Pachamama’s “work” in Ecuador does not contribute to “changing the dream of the North” – rather, it enables the nightmare of the North to continue. One could argue that the authors of this article demonstrate paternalism in rejecting the notion that the Achuar were/are free in all decision-making capacity and have embraced Western values of their own free will. There is no doubt that these dynamic men, women and communities embody an ethical intelligence far exceeding any intellect claimed by the Euro-American. That being said, an ethical intelligence is no match to the pathology espoused by defenders/believers in a predatory capitalist system dependent upon infinite growth where White “values” embodied in the global economy are forever sacrosanct and must/will always dominate and prevail. The colonization of Latin America has never ended. Like a chameleon, it simply changes it colours. Like a parasite, it simply changes its hosts. Earlier it was suggested that we try to imagine Soviets establishing Soviet NGOs espousing Soviet ideologies/policies on American soil during the Cold War. Few would argue that such an undertaking would have been tolerated then or now. 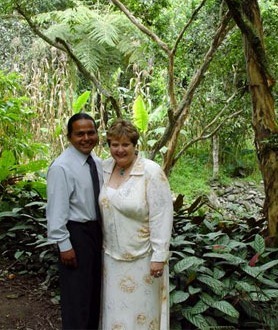 Now, for a just a moment, try to imagine if Muslims were setting up residence in Ecuador and throughout Latin America – distributing the Koran throughout the jungles. In this scenario, one’s instant reaction (anxiety/panic for most Euro-Americans) has already been programmed/pre-determined by the establishment via psychological warfare. White skin: good. Brown skin: Irrelevant. Black Skin: Danger. Islam: Extremists. One can send their regards to the Obama Administration who propels the international terror psy-ops campaign largely targeting Muslims and Muslim tribes. Publicly, the U.S. “save” tribal people of Amazonia while Muslim tribal people in the Middle East are framed as terrorists or fanatics. Both forms of power (soft power versus hard power) are imperial in nature. Frenemies. Michael Allosso, The Ocean Conservancy, our Achuar guide: “We flew in small planes into the remote jungle near the Peruvian border. Here, a group of indigenous people called the Achuar (unknown to the outside world until 1972) are developing ecotourism as an alternative to oil company deforestation.” [Source] For more on The Ocean Conservancy read Marine Protection Reserves as Privatization Scam, Wal-Marting the Oceans. Replace television with iPads. Add the spread of TB to animals, and measles into the rainforest, and welcome to 21st century eco-colonialism. Consider that in Chobe, Botswana, mongooses are thought to have caught the human disease TB from rubbish heaps outside a tourist lodge that were contaminated with the human pathogen. Less clear is how the meerkats became infected. [Source] If human pathogens are infecting animals via ecotourism ventures, then we must consider how Indigenous tribes, having been forever isolated from the outside world, can protect themselves from these same pathogens that have been transmitted to animals. On December 16, 2011, it was reported that “a major outbreak of measles in Kapawi, province of Pastaza, forced authorities to declare a quarantine in the community living around 300 indigenous Achuar…. We have contacted Kapawi Lodge who informed us that operations at the lodge are running smoothly and everything normal – no changes in terms of tourism operations. All staff have been vaccinated.” It is not clear where the measles were contracted from, yet it begs the question as to how Indigenous tribes, including children and elderly who have no immunities to these diseases, can possibly protect themselves. One can be fairly certain that if these communities are receiving vaccinations, such highly controversial conduct would not be readily discussed with the public. One must wonder how Americans help “revitalize Achuar culture and tradition” by creating a dependence on a money economy – development under the guise of conservation? And although Pachamama Founders would have the public believe they were called by the Achuar via what amounts to luminescent dreams and ethereal smoke signals, the spiritual stratagem could be considered liberal marketing bravado for today’s transcendental philanthropist and celestial capitalist. Daniel Kouperman is a co-founder of Pachamama Alliance and past president (and board vice-president) of the Pachamama Foundation situated in Ecuador. 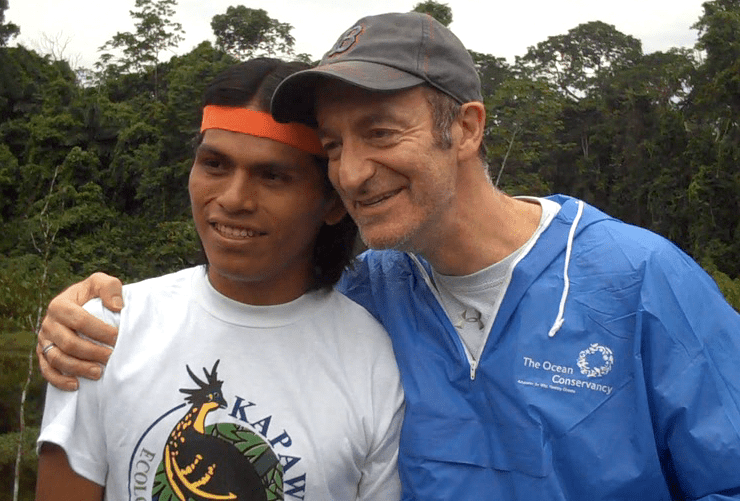 “Ordoñez (manager of the Kapawi Ecolodge & Reserve) says that the intercultural management is complex. The transition of Kapawil Lodge from Conodros to the Achuar, though formalized years ago, is still a work in process. ‘The Achuar colleagues did not comprehend 100 percent how to manage the company,’ he says. That, however, is slowly changing, thanks in part to the Pacha Mama Foundation, a non-profit organization that was created precisely to support the Achuar of Ecuador through various projects. “One of those projects was Aero Achuar in which Pacha Mama helped the community acquire an airplane to establish their own air transportation service. Kouperman, who is also president of the Pacha Mama Foundation in Ecaudor, says two young Achuar members have obtained pilot licenses and are in their first 500 hours of training. Another Achuar member is a fully trained and licensed mechanic. 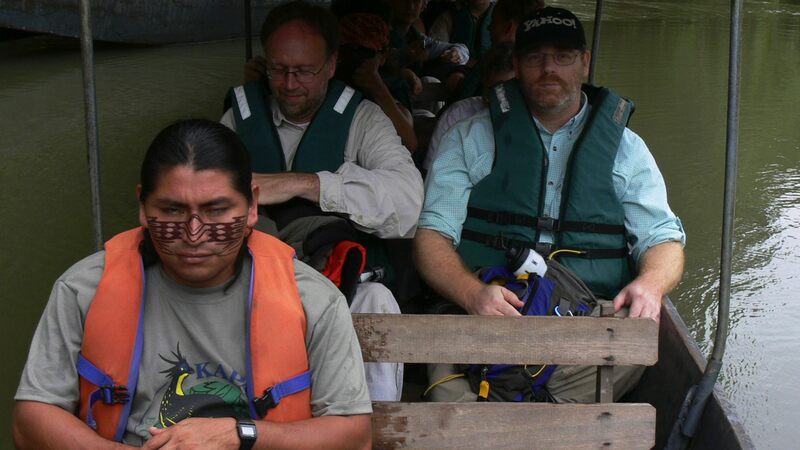 Photo: Tourists in a boat with an Achuar naturalist/guide at Kapawi Lodge, Ecuador, 2005. Yet while Pachamama Alliance boasts publicly on their website that “Kapawi Ecolodge and Reserve is a thriving refuge run by the indigenous,” the reality, again appears quite different. And we are to believe this is success? Disciplined capitalists of hegemony leave nothing to chance. The Kapawi eco-tourism project would be no exception. A high quality English instruction program commenced in the Kapawi Achuar community and Kapawi Ecolodge in November 2005. Profitability must be prioritized over safeguarding both living ecosystems and culture, as that is the nature of the capitalist beast. Even legitimate concern can only lend itself as far as the profitability of eco-tourism may allow. Profit not only outweighs protection; in the 21st century, profit, along with growth, is sacrosanct. A minga (Quechua) is a traditional work cooperative of sorts, a communal work party in the Andes and the Amazon. A fairly new venture (2012), International English Minga (IEM), in partnership with the University of San Francisco, the Pachamama Alliance and NAE, refers to itself as a catalyst for “wide-scale collaboration” giving way to “global community work parties and common purpose” and building “better pedagogy.” The said mingas (which include approximately 17 Americans who fly into the Amazon) focus on the teaching of the English language to the Achuar. Although this is said to be a partnership of exchange, there is no indication of the San Francisco student teachers reciprocating by learning the language of the Achuar – which is endangered. A well-intentioned White saviour/Minga veteran believes that “this Minga will be a catalyst which brings the concept of Minga into this new century – that experts of all kinds will want to come and want to partake in this amazing new way of teaching and learning.” While minga implies it will safeguard indigenous peoples’ interests, it demonstrates superiority and reinforces coloniality by imposing “expert” knowledge from the “West” upon the local people. One must note the willful (perhaps instilled is more accurate) disregard and avoidance of any examination of White/First World privilege with no meaningful efforts whatsoever to counteract it. Rather, they are completely oblivious to it. Yet, this, too, is to be fully expected in our corporatized educational institutions. It is of interest that in the photographs provided by the students on the IEM website, the Achuar people are rarely painted when in a natural social setting. Although the face/body painting was reserved as a practice for special occasions, today the painting is fully exploited for the benefit/entertainment of Kapawi tourists and outsiders. Stunning photographs of the beautifully painted Achuar serve as the prime advertising imagery for attracting international tourism. In the 2011 thesis, “Take a Picture with a Real Indian”: (Self-) Representation, Ecotourism, and Indigeneity in Amazonia, Ami Temarantz explores Indigenous identity in the online marketing of three ecotourism lodges, including Kapawi. The paper demonstrates how those (the Indigenous) exploited by such “social experiments”  (experiments designed to create dependency upon international tourism and an industrialized capitalist economy), are compelled to engage in the “ecologically noble savage myth” vis-à-vis emotive and spiritual “language that appeals to the Western ecological imagination” – in order to attract the Euro-American tourist in a highly competitive and aggressive industry. Under these social experiments, aspects of everyday life (the lives of Indigenous peoples) may or may not be suppressed “in order to cater to the fetishistic tourist image of ecological nobility” an Indigenous authenticity preferred by the West. Yet, not surprisingly, authenticity is willfully avoided by the tourist when it comes to perceivable threats (dangerous insects, for example) or physical difficulty (such as having to trek through the jungle carrying one’s own luggage). The adoration and desire for authenticity, as if by magic, all but disappears when access to luxury on demand is threatened. As an example, the romanticism of Indigenous authenticity would no doubt quickly dissolve if a tourist had to launder their own bedding each day in the river. How Indigenous communities, now saddled with intense pressure to allure, seduce and satisfy White privilege, can continue to evolve naturally under such conditions appears to be of little interest to White saviours. Again, as throughout history, the Achuar are presented as the lucky beneficiaries of Western development and ideologies, thereby, yet again, assigned to their historic role as the passive novelties/objects of rapacious colonial ambition. Further, for how long will the Achuar be satisfied spending their lives literally serving White privilege (“a haven of ease, good taste, and understated luxury”) only to return at the end of each long day (or weeks on end) to dirt floors and discarded Nike t-shirts? How this can truly be considered a foundation to build relationships based upon mutual respect and equality is anyone’s guess. Airplane pilots, mechanics, flying students to English schools in the US, and university degrees in hotel management: if this does not fall under the description of colonization, one must wonder what does. “Kapawi ?Lodge,? Ecuador:? A? full? partnership? project? with ?the? Indigenous? Organization? of? Ecuadorean? Achuar? nationalities ?(OINAEI). ?” [Source] (OINAEI is also referred to as the Indigenous Organization of Achuar Nationality of Ecuador.) OINAEI is now formally recognized as NAE (Achuar Nationality of Ecuador or Achuar Nation of Ecuador).